The Hyundai Grandeur (Korean: 현대 그랜저, Geuraenjeo) is a mid-size car produced by the South Korean manufacturer Hyundai since 1986. From 1986 to 1996, the Grandeur was a flagship car for Hyundai's South Korean lineup before the Hyundai Dynasty came out. The Grandeur has evolved through five generations with intermediate restylings, and is marketed under various nameplates worldwide—prominently as the Hyundai Azera (현대 아제라, Ajera). As the Azera, it was considered the flagship model of Hyundai's United States lineup until the arrival of the Genesis sedan. Since the launch of the separate Genesis brand, the Grandeur/Azera has redeemed its place as the company's flagship instead of being slotted between the Sonata and the Genesis G80 as a less sporty option of the latter. As of July 2017, the sedan is available in South Korea, China, the Middle East, and the Americas (except Mexico); as of the 2017 model year, the Azera is no longer sold in the United States and Canada but continues to be sold in the aforementioned regions. Before the 1988 Seoul Olympics, most of the luxury car market of South Korea was held by Daewoo Motors and its Royale Series. From October 1978, Hyundai built its luxury car, Ford Granada Mark II, in Korea but the competition with Daewoo Royale seemed that it already had ended. As Hyundai was looking to enter the luxury car market, it tried to make its own luxury car. In the face of tough competition from Daewoo Motors' much more powerful brand, Hyundai abandoned the attempt to design its own luxury car, and instead borrowed the platform, technology, and internal configuration from Mitsubishi Motors to create the first Hyundai Grandeur. In the early eighties, Mitsubishi Motors also wanted to renew its aging Debonair model, which had not been substantially updated since its market launch in 1964. Given the existing relationship of sharing technologies and innovations, Mitsubishi accepted Hyundai's request to share a platform, internal configuration, and most importantly, an engine. As Hyundai was an official sponsor of 1988 Seoul Olympics, it used this opportunity to notify all the executives and important people about their new car, the Grandeur. Because of its Mitsubishi basis and good quality, it became very popular in Korea. Also called "Gak (angle)-Grandeur", it succeeded Ford Granada Mark II. Before the 1988 Summer Olympics, the official sponsor Hyundai Motor co-developed it with Mitsubishi Motors of Japan, and launched it in July 1986. The design was done by Hyundai Motors, but the internal configuration was done by Mitsubishi. It was the second FF layout model in Korea after Hyundai Excel. Originally, only a four-cylinder 2,000 cc engine and manual transmission were offered, but later a 2,400 cc engine, a V6 3,000 cc engine, and automatic transmission were equipped. The Grandeur became Korea's bestselling large car by a considerable margin. It was also sold in Japan as the Mitsubishi Debonair V, but the demanding class was already absorbed by the Toyota Crown, Nissan Cedric/Gloria, Mazda Luce, and Honda Legend and the Debonair was not competitive. Taillight design was changed in 1989, and ABS first became available in 1991. It had 4-speed automatic transmission or 5-speed manual transmission. It was discontinued in September 1992, after 122,074 had been built. The "New Grandeur" came in various trim levels and only V6 engine combinations (2.0L, 2.5L, 3.0L, and 3.5L). The new Korea based Grandeur became a huge success following the first generation Grandeur it replaced. However, the reception of the same model marketed by Mitsubishi in Japan was perfunctory eventually leading Mitsubishi to discontinue it earlier than expected. The 3-liter and 3.5-liter engines developed by Mitsubishi were substantial legacies to Hyundai, which at the time did not have the ability to manufacture engines of that size on its own. Following the Debonair's discontinuation in Japan, the Hyundai-Mitsubishi partnership led to the production of the Hyundai Equus and Mitsubishi Dignity premium flagship sedans, and the slightly smaller Hyundai Dynasty and Mitsubishi Proudia. Since the production of Hyundai Equus, Hyundai develops all engines in its product line on its own, such as the industry-acclaimed 4.6-liter Tau Engine featured on the Hyundai Genesis. Although it was not exported outside the home market, the second generation Grandeur was a success in the Korean domestic market as the flagship sedan of Hyundai lineup. This model became a status symbol in Korea, which many politicians and wealthy business executives have used. The Grandeur XG was a mid-size luxury car. In some other markets, namely North America and also Japan, it was called the Hyundai XG. The first two generations were essentially rebadged Mitsubishi Debonairs, with the third generations developed entirely by Hyundai, with technical experience learned from the first two generations. It shared a platform and engines with the Kia Opirus (Amanti in North America). After their success with the Grandeur, Hyundai decided to develop the next generation Grandeur on their own from the ground up with the technology they have accumulated through the past Grandeur generations. This allowed Hyundai to export the XG outside South Korea without any possible legal issues. The XG250 was debuted in 1999 with a 2.5 L Delta V6. It was also called the XG25 in some markets. It was produced until 2005. There was also a two-liter model called the XG20 for some markets, including the domestic South Korean one. The XG300 debuted in 1999 with a 3.0 L Sigma V6. It was called the XG30 in Europe and in Asian countries. It was produced from 2001 to 2003. A 2.5-liter model, called XG25, was also sold in some countries such as France. The XG30 boasted many options available to only high-end luxury models at the time such as the Mercedes E-class and BMW 5 Series. The XG30 is also longer and wider than most of its rivals, and it is just a fraction smaller than the Audi A6. In the United States, the XG300 equipped with the 3.0-liter V6 engine was available for the 2001 model year only. The "L" model included heated front seats, rear seat reading lamps, two-position driver's side memory seat and outside mirrors, power moonroof, 6-speaker Infinity AM/FM/CD/cassette stereo system, wood-tone accented steering wheel, electrochromic rearview mirror with a built-in three-channel HomeLink-compatible garage door opener, and a parking aid feature that automatically tilted the dual exterior mirrors downward when the transmission is in reverse. A slight discount was available on XG300 models that deleted the automatic electronic climate control in favor for a manual three-dial system. Other options included a power moonroof on the base model, and a trunk-mounted eight-disc CD changer for the L model. The 2002 XG350 models were equipped with a larger 3.5-liter V6 Sigma 194 hp (145 kW) engine. While only providing 2 hp (1.5 kW) more horsepower than the previous engine, it offered an additional 38 lb⋅ft (52 N⋅m) of torque, now rated at 216 lb⋅ft (293 N⋅m). New 16-inch bright 10-spoke alloy wheels were an inch larger than for the 2001 model year. In the United States, the power moonroof was no longer an option on base models. 2003 brought a new instrument cluster, and updated graphics for the console trip computer. In the 2004 model year, the XG350 received larger front brakes (discs went from 10.9- to 12-inch), which in turn required a 16-inch spare tire as standard equipment, replacing the 'space-saver' design used since 2001. Also new this year were restyled front and rear bumpers, bodyside moldings, headlights (now with HID availability), driving lights, tail lamps, grille, and deck lid with recessed license plate holder. The high-mounted stop lamp in the rear window went to an all-new LED design. The interior wood-tone trim changed to a lighter shade, glove compartment and storage bins were now covered in charcoal gray material (formerly black), the door-mounted power window switch panels now matched the interior color (previously, they were high-gloss wood-tone), recessed seat tethers allowed for secure installation of child seats in all three rear seat positions, and the trunk hinges were now supported using hydraulic pistons. Standard equipment leather upholstery was available in solid deep charcoal or a two-tone finish featuring a tan interior with brown dashboard/center console and upper door trim. The L versions were equipped with specific 12-spoke silver-painted allow rims featuring center caps covering the lug nuts. Minor equipment changes inside included redesigned levers for the hood release and tilt steering column, an updated cruise control switch, a recessed trunk pull-down handle, and leather trim around the console armrest tray. 2005 was the last model year for the XG350, as it would be replaced at the top of the Hyundai line-up by the 2006 Azera. Both the base and L models now offered the formerly optional carpeted floor mats as standard equipment, while the L model was now equipped with a standard trunk-mounted eight-disc CD changer. The driver's door switch panel featured a restyled power door lock button; it was now designed to feel less like the adjacent power window controls, for ease of differentiation by touch. 2.0 and 2.5 Delta engines were available in South Korea. The Grandeur TG is a mid-size sedan introduced for the 2006 model year. A redesigned XG350, it shares a platform with the Sonata. It is sold as the Hyundai Azera in North America, China, Taiwan, Philippines, Iran, Malaysia, The GCC (Persian Gulf states), South Africa, Singapore, Peru, Chile and Brazil. In Europe, Australia, New Zealand and Japan it was sold as the Grandeur. The Grandeur/Azera had been the most expensive Hyundai model outside of Korea, China, and the Middle East—until the 2008 introduction of the Genesis. The Azera has a four-wheel independent suspension (multi-link in the rear) and uses the company's new 3.8 L Lambda V6, which produces 265 hp (196 kW). The power is sent to the front wheels through a five or six-speed automatic transmission with a "Shiftronic" manual gear selection. Hyundai claims 6.0 s to accelerate to 60 mph (97 km/h) and a top speed of 155 mph (250 km/h). Fuel economy of 19 mpg (12.4 L/100 km) in the city and 28 mpg (8.4 L/100 km) on the highway is expected. The Limited trim level adds 17-inch alloy wheels, heated front seats, leather seat-upholstery, and a power sun shade in the rear window. The Ultimate Package includes an enhanced audio system with 10 Infinity speakers and a 6 CD changer, a power sunroof, powered tilt-telescopic steering wheel, and rain-sensing windshield wipers. The 2007 model featured a revised gauge pattern and steering wheel controls. The 2008 model introduced the optional LG Navigation system. The SE models are removed in favor of a GLS model that shares the same 17-inch wheels as the Limited models, and the Aubergine color is no longer available. A wood-trimmed steering wheel is now only available with the Ultimate Package. The 2009 model featured a new grille, new 17-inch 10-spoke alloy wheels, blue back lit gauges and dashboard lighting (vs. the previous green), dark brown wood grain accents and available hands free Bluetooth phone capability. The audio player display takes the same design as the 2009 Hyundai Sonata, and the controls for the audio player have been redesigned. An auxiliary input jack and iPod integration system is now standard, though deleted in the case of the LG Navigation system on the Limited trim level. A wood-trimmed steering wheel is once again standard for the Limited, and Limited models receive special hyper-silver finished alloy wheels. The Korean Grandeur offers more features not available in North American version, such as Proximity Key with Push Button Start and Bluetooth hands-free capability. A refreshened 2010 model was released on 16 December 2009 that incorporated new 7 split-spoke alloy wheels, LED taillights, rectangular exhaust pipe designs, new side mirrors, redesigned headlights, and new front fascia and grille. New interior amenities include Alcantara leather seats and rear passenger audio and climate controls. For the 2010 model year the Hyundai Azera was dropped in Canada due to slow sales. For model year 2011, Hyundai restyled the Azera with new front and rear fascias, new alloy wheels, and new fog lamps. The engines have been updated with dual variable valve timing and the transmission has one more forward for a total of 6. The 3.3L V6 is now rated at 260 hp and 3.8L V6 now makes with 283 hp. The fuel economy has also been improved with 20/28 for 3.3 and 19/27 for 3.8 (EPA rating pending). The Azera comes standard with front airbags for driver and passenger, front and rear head curtain airbags and front and rear seat-mounted torso airbags. According to the Insurance Institute for Highway Safety the Azera received a Good overall score in the frontal crash test and an Acceptable overall score in the side impact test. The driver's pelvis/leg in the side impact category was given a Poor score and the structure/safety category rated Marginal. 2006 Canadian Car of the Year awards: named "Best New Family Car (over CAN$35,000)"
Strategic Vision, 2007, named the "Winner Strategic Vision's 2007 Total Quality Index (TQI) for the large car segment"
Kiplinger’s Personal Finance 2007 Car Buyer’s "Best of 2007 Cars" March 2007. Consumer's Digest, 2007, named "A Consumer's Digest Best Buy"
J.D. Power and Associates – 2006: named "Most Appealing Large Car"
IIHS, 2006, earned an overall "good" rating in the crash test, frontal offset impacts. Strategic Vision, 2006, named the "Winner Strategic Vision's 2006 Total Value Award for Best Large Car Ownership Experience"
The fifth generation Grandeur/Azera was unveiled at the 2011 Los Angeles International Auto Show as a 2012 model. It was developed over a period of three and half years with a cost of 450 million dollars. The Grandeur nameplate remained in use in South Korea, but most export markets received it as the "Hyundai Azera." The Grandeur HG was released by Hyundai with an all new appearance and an engine The Grandeur HG followed the "fluidic sculpture" design of modern Hyundai vehicles. This design is dubbed as the "Grand Glide" concept. The four-cylinder has a fuel economy of 12.8 km/L (36 mpg‑imp; 30 mpg‑US) (7.8 l/100 km) and the V6 is rated at 11.8 km/L (33 mpg‑imp; 28 mpg‑US) (8.5 l/100 km). The Premium model features adaptive cruise control and a semi-automatic parking assist system. Early Korean models of Grandeur include Theta II 2.4 GDI, Lambda II 3.0 GDI. In Korea an E-VGT R2.2 Diesel engine with 202 PS (149 kW; 199 hp) is available. Korean version equipment includes auto high beam, lane departure warning, blind spot detection, and electric park brake. Theta 2.4 MPi Hybrid 2013–2016 2,359 cc (144.0 cu in) I4 159 PS (117 kW; 157 hp)@5500 21 kg⋅m (206 N⋅m; 152 lbf⋅ft)@4500 ? ? Electric motor 47 PS (35 kW; 46 hp)@? Combined 204 PS (150 kW; 201 hp)@? Theta 2.4 GDi 2011–2016 2,359 cc (144.0 cu in) I4 201 PS (148 kW; 198 hp)@6300 25.5 kg⋅m (250 N⋅m; 184 lbf⋅ft)@4250 ? ? Lambda 3.3 GDi 2011–2017 3,342 cc (203.9 cu in) V6 297 PS (218 kW; 293 hp)@6400 35.3 kg⋅m (346 N⋅m; 255 lbf⋅ft)@5200 7.4s ? 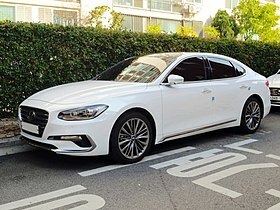 It is a version of Hyundai Grandeur for South Korea market, with 2.4-liter Theta II MPi (159PS) engine, 47PS electric motor, projector beam headlights, LED taillights, a dual exhaust system, 17-inch aluminum wheels, Nappa leather seats, a leather-wrapped steering wheel and wood grain trim, dual-zone automatic climate control, heated seats, a rearview camera, a USB charging system, an infotainment system with a 6-inch display. Options include a panoramic sunroof, a premium audio system and GPS navigation. The vehicle went on sale on 17 December 2013. Changes to US models of Hyundai Azera include lower starting price of $31,000 ($1,250 reduction from 2013), refined steering feel and precision, standard 6-inch color LCD audio display with rearview camera, standard driver blind-spot mirror, new electroluminescent gauge cluster with color LCD trip computer, new 8-inch navigation system standard on Limited, power-folding side mirrors standard on Limited, Hyundai Assurance Connected Care telematics services standard for three years. Hyundai unveiled its sixth-generation Grandeur on October 27, 2016. The sixth-generation model will not be sold in North America due to slow sales, and other than Hyundai's new luxury division, Genesis, the Sonata will become the largest and most expensive sedan Hyundai sells in the US. The 2.2 L diesel engine option was discontinued in 2018. 132,000 Grandeurs were sold in 2017 and about 110,000 vehicles were sold in 2018. It is the best selling vehicle in South Korean market. Since its introduction to the U.S. market in late 2000, the XG/Azera had been a consistent seller until late 2008, when it suffered a significant drop in sales. Although there are several possible explanations for this decline, the Hyundai Genesis sedan was introduced to the U.S. market in late 2008, suggesting that the more sophisticated rear-wheel drive Genesis may have cannibalized sales of the Azera. The Hyundai Genesis sedan is considered by auto journalists to be a rival to the aforementioned full-size and near-luxury vehicles that the 2012 Azera is positioned against, such as the Ford Taurus, Toyota Avalon, and Buick LaCrosse. ^ "Hyundai teases new Azera which will not come to the US". ^ a b "Blast From the Past #16: The elite's ride of choice, from CEOs to mobsters". Korea JoongAng Daily. 22 February 2010. Archived from the original on 23 March 2012. Retrieved 1 September 2011. ^ a b "Avera Motors changes name to Rivian Automotive, begins road tests". Autoblog. 15 March 2011. Archived from the original on 17 March 2011. Retrieved 17 March 2011. ^ "IIHS-HLDI: Hyundai Azera". Iihs.org. 25 November 2008. Retrieved 14 October 2009. ^ "Safercar.gov". Safercar.gov. 4 September 2007. Archived from the original on 17 September 2008. Retrieved 14 October 2009. ^ a b c February 2012 BY ANDREW WENDLER. "2012 Hyundai Azera First Drive – Review – Car and Driver". Caranddriver.com. Retrieved 20 October 2012. ^ a b Ulrich, Lawrence (16 March 2012). "Moving to the Intersection of Avalon and LaCrosse". The New York Times. ^ a b You must be logged in to post (24 February 2012). "First Drive: 2012 Hyundai Azera – Automobile Magazine". Automobilemag.com. Retrieved 20 October 2012. ^ "2012 Hyundai Grandeur 5G gets 3.0L GDI V6 Theta engine". hyundai blog. 13 January 2011. Archived from the original on 27 January 2011. Retrieved 15 January 2011. ^ "Grandeur". Hyundai Motor Korea. Hyundai Motor. Archived from the original on 2015-03-26. Retrieved 19 January 2015. ^ Hyundai. "Hyundai Grandeur Hybrid introduced, features a combined output of 204 HP". Motor1.com. Retrieved 6 April 2019. ^ "2014 Hyundai Azera gives you more for less". Autoblog. Retrieved 6 April 2019. ^ "Cima Motors / Hyundai : Lancement imminent des nouvelles SONATA et AZERA made in Dz". www.autobip.com. Retrieved 6 April 2019. ^ "Hyundai Will Drop The Azera From Its U.S. Lineup". carscoops.com. 5 July 2017. Retrieved 6 April 2019. ^ Stocksdale, Joel (July 6, 2017). "Hyundai Azera large sedan officially dead in America". Autoblog. ^ "2010 Ford Taurus Limited AWD vs. 2011 Toyota Avalon Limited vs. 2010 Hyundai Genesis 3.8 Comparison". Motor Trend. Retrieved 20 October 2012. ^ "Buick LaCrosse vs. Ford Taurus, Hyundai Genesis, Lexus ES350 – Comparison Tests". Caranddriver.com. 10 October 2012. Retrieved 20 October 2012. Wikimedia Commons has media related to Hyundai Grandeur. Wikimedia Commons has media related to Hyundai XG. Wikimedia Commons has media related to Hyundai Azera. This page was last edited on 6 April 2019, at 06:17 (UTC).